Posted on Mon, Jan 14, 2013 : 10:24 a.m. Though the health care sector has had the most job growth even during the recent recession, newly licensed registered nurses are finding it difficult to gain employment, according to a report by CNN. 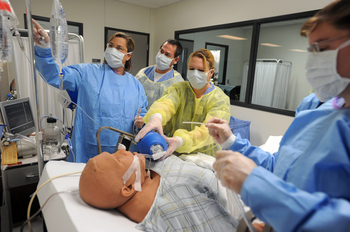 Many area nursing schools have wait lists for enrollment, like the program at Washtenaw Community College pictured here. CNN reports newly-licensed registered nurses have difficulty finding employment. The American Society of Registered Nurses states that 43 percent of registered nurses licensed from Jan. 1 2009 to March 31, 2010 did not have jobs within 18 months of graduation. The registered nursing profession is dominated by women, and tight economic times means less of them are choosing to leave work - which makes for a tight job market, according to the report. However, more students are enrolling in nursing colleges than ever before. Wed, Jan 16, 2013 : 2:51 p.m. The key in your newest article is that SOME new grads have found work here within months of graduation. Nowhere does the new article specify a percentage of those lucky enough to land a job versus those who do not. Neither is there a mention of the fact that only a handful of those jobs open will consider new grads and that more than 100 applications are received for those that are. I think a little more research into the statistics needs to be done. As for your &quot;experts,&quot; quoting administrators whose job it is to encourage enrollment makes them a dubious choice for impartial information and they are far from &quot;experts&quot; on hiring trends. Job one would be to contact the nursing organizations in the state of Michigan to find out if they have any hard statistics that show the trends for hiring new grads in our area. Tue, Jan 15, 2013 : 2:32 p.m.
All, I followed up on the local trend data for this story. Registered nurses may not have found as receptive of a job market within the past two years here in Michigan as they did 10 years ago: It took three to four months for recent grads to find a job, but the 43% figure does not ring true here. Check my other story &quot;Hiring outlook for nursing grads in Michigan remains positive, experts say&quot; for more. Tue, Jan 15, 2013 : 2:18 p.m.
Three year old data is not worth reading. Tue, Jan 15, 2013 : 11:41 a.m.
Should check with UM - an in earlier article, it stated there were many openings. Mon, Jan 14, 2013 : 11:06 p.m.
Mon, Jan 14, 2013 : 10:13 p.m. This was from 2009-2010. It's THREE years old ? What's the relevancy today ? Mon, Jan 14, 2013 : 10:05 p.m.
Like any &quot;hot&quot; profession, there are a lot of people who aren't qualified coming into the work force. The good ones hopefully will stick with it long enough to find work. What doesn't help is unionization. This creates less employment and protects seniority ahead of competence. Seems like the author preferred to attribute this observation to baby-making rather than unionization. But if baby-making were the problem, you'd see a different pattern in the workforce, not simply those with a year of experience retaining jobs. Mon, Jan 14, 2013 : 9:26 p.m. I wonder how many of these unemployed people are willing to move to take a job and are willing to work nights. Many rural areas are screaming for medical professionals. Mon, Jan 14, 2013 : 8:35 p.m. SE Michigan/NW Ohio is home to many nursing schools; most award BSN's which is becoming the degree-of-choice for most large health and hospital systems. Some grads may need to consider moving to less urban parts of Michigan or elsewhere to get a job where there would be more demand for RNs. Mon, Jan 14, 2013 : 7:49 p.m. Reimbursements are being cut drastically for Medicare, so more must be done with less. Experience is key, but you can see the age of nursing staffs is creeping up as is the age for other skilled professions. It's a sign of the times and bad news for new grads, bad news for the baby boomers too. You are going to receive poor care in the future with not enough health care professionals to take care of you and a broken health care system. Welcome to the new normal under Obamacare, more to come in 2014, stay tuned, and don't forget you will get end of life counseling at no charge............now that's comforting! Maybe they should become counselors since there will definitely be a rise in demand for those services. Tue, Jan 15, 2013 : 6:39 a.m.
With many presently lacking health care insurance who will be covered under the ACA more demand for nursing services will result and more money will be available to pay for it. So nursing employment opportunities may increase this year and next. Mon, Jan 14, 2013 : 7:40 p.m.
Mon, Jan 14, 2013 : 7:30 p.m.
Is this also the case for advanced practise nurses such as Crna's (Certified Registered Nurse Anesthetist) ? Mon, Jan 14, 2013 : 6:37 p.m. If insurance pays for most health coverage, why would there be a decline in nursing jobs during the recession? In particular, when there are more aged patients supported by Medicaid/Medicare who require the bulk of nursing assistance. Maybe legislators cut too many people off of the public dole. Or hospitals are trying to &quot;economize&quot; by splitting the nursing profession into the 1% and the have nots by hiring cheaper nursing aides. Mon, Jan 14, 2013 : 7:51 p.m.
Mon, Jan 14, 2013 : 5:38 p.m. The lack of job availability is bad news. The one kernel of good news is that we have so many people that want to make a career in of a profession that helps others. Mon, Jan 14, 2013 : 5 p.m. Ten years ago the headline was that nursing was the profession of the future and the articles estimated a vast increase in nursing jobs over the next ten years. I've been in healthcare for 8 years now, in an area other than nursing, and nursing is still the &quot;hot&quot; career path for healthcare/hospital work. The tough part is getting enough experience to be a desirable candidate, then jobs are abundant from what I've observed. I think the trends for all jobs in healthcare are analagous to those presented in this article because many hospitals are now in financial limbo or are selling out to corporate managed, multi-hospital companies to get out of the red. Mon, Jan 14, 2013 : 4:30 p.m.
Its really a shortage of competent HR staff to fill the nursing positions that are available by the hundreds. Mon, Jan 14, 2013 : 4:11 p.m.
anecdotally it took my daughter 7 months to land a job after she graduated. She does not live around here. She lives 6 hours south. Mon, Jan 14, 2013 : 4:01 p.m. While the reseacher may well be correct in linking this to the recession and RNs returning to the workforce during the recession and not leaving, I think the story goes deeper. As hospitalized patients are increasingly sick, hospitals are looking to hire staff with more experience and greater flexibility for roles/units. Some hospital systems are also shifting towards a preference for bachelors-prepared nursed (BSNs) over those without a bachelors, even though they take/pass the same boards. So that leaves behind the RN grads who didn't take the BSN path - especially in urban areas where they can be more picky. Mon, Jan 14, 2013 : 3:43 p.m. I'm currently checking in with local nursing schools and hospitals to see if this report from CNN rings true here in Washtenaw County. Do you think it's reflective of the market here? Tue, Jan 15, 2013 : 2:25 p.m.
We ran an aggregation of the CNN story yesterday because it was a national media outlet reporting on a hiring trend that affects many individuals in Washtenaw County. I've since checked in with the local trends and it looks like the CNN report is not indicative of the job market here for registered nurses; headline of that story is &quot;Hiring outlook for nursing grads in Michigan remains positive, experts say&quot; which was published this morning. Tue, Jan 15, 2013 : 2:19 p.m.
Three year old data is not worth reading as far as I am concern. I think that is probably something you should do before you run the story, yes? Mon, Jan 14, 2013 : 11:16 p.m.
Sparty, I'm all over it. Mon, Jan 14, 2013 : 10:16 p.m.
How about something newer than the 2009-2010 results reported in the article ? Mon, Jan 14, 2013 : 6:03 p.m.
nope. I know 3 new grads who all had jobs before they graduated. The big schools in the area are: UM, EMU, and Madonna. Mon, Jan 14, 2013 : 5:35 p.m.
From what I've heard from friends in the area who have received their nursing credentials, it's been tight for the past few years. I wonder if that's just anecdotal, or the situation is the same as the national trend. I'm curious what you find. Mon, Jan 14, 2013 : 3:36 p.m. The UofM Job Site has almost a hundred nursing positions posted currently for work at the U Hospital.